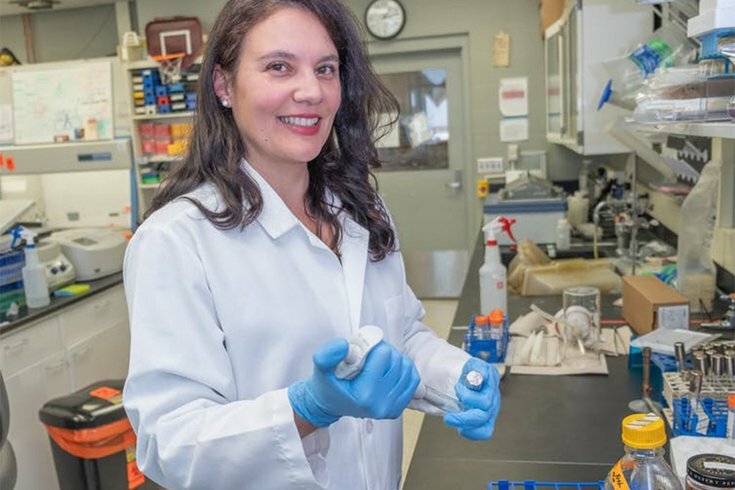 Dr. Alessandra Agostinho Hunt measures biofilm formation of Psuedomonas aerugionsa by pipetting in the purple dye crystal violet to stain the microbial structure. Maybe you’ve had the experience of wading in a stream and struggling to keep your balance on the slick rocks, or forgetting to brush your teeth in the morning and feeling a slimy coating in your mouth. These are examples of bacterial biofilms that are found anywhere a surface is exposed to bacteria in a moist environment. Besides leading to falls in streams or creating unhealthy teeth, biofilms can cause large problems when they infect people. Biofilms, multicellular communities of bacteria that can grow on a surface encased in their own self-produced matrix of slime, can block immune cells from engulfing and killing the bacteria or prevent antibodies from binding to their surface. On top of this, bacteria in a biofilm resist being killed by antibiotics due to the sticky nature of the matrix and activation of inherent resistant mechanisms, such as slow-growing cells or the ability to pump antibiotics out of the cell. Biofilms are one of the primary growth modes of bacteria, but all antibiotics currently used clinically were developed against free-swimming planktonic bacteria. This is why they do not work well against biofilms. My laboratory studies how and why bacteria make biofilms, and we develop new therapeutics to target them. Because antibiotic resistance is the most problematic aspect of biofilms during infections, we set out to identify novel molecules that could enhance antibiotic activity against these communities. We discovered that an antimicrobial that has recently obtained a bad reputation for overuse in many household products could be the secret sauce to kill biofilms. To find such compounds, we developed an assay to grow plates of 384 tiny biofilms of the bacterium Pseudomonas aeruginosa. We did this to screen for molecules that enhance killing by the antibiotic tobramycin. We chose this bacterium and this antibiotic as our test subjects because they are commonly associated with cystic fibrosis lung infections and treatment. People with cystic fibrosis (CF) are at particular risk from biofilm-based infections. These infections often become chronic in the lungs of cystic fibrosis patients and are often never cleared, even with aggressive antibiotic therapy. After we screened 6,080 small molecules in the presence of tobramycin, we found multiple compounds that showed the antibiotic enhancement activity we were searching for. Of particular interest was the antimicrobial triclosan because it has been widely used in household products like toothpaste, soaps and hand sanitizers for decades, indicating that it had potential to be safely used in CF patients. Triclosan has also garnered a bad reputation due to its overuse, and states like Minnesota have banned it from these products. The Food and Drug Administration banned its use from hand soaps in September 2016. This ruling was not based on safety concerns, but rather because the companies that made these products did not demonstrate higher microbial killing when triclosan was added, compared to the base products alone. Another fact that piqued our interest is that P. aeruginosa is resistant to triclosan. Indeed, treatment with either tobramycin or triclosan alone had very little activity against P. aeruginosa biofilms, but we found that the combination was 100 times more active, killing over 99 percent of the bacteria. We further studied this combination and found that it worked against P. aeruginosa and other bacterial species that had been isolated from the lungs of CF patients. The combination also significantly enhanced the speed of killing so that at two hours of treatment, virtually all of the biofilm is eradicated. Our efforts are now focused on pre-clinical development of the tobramycin-triclosan combination. For CF, we envision patients will inhale these antimicrobials as a combination therapy, but it could also be used for other applications such as diabetic non-healing wounds. Although questions about the safety of triclosan have emerged in the mainstream media, there are actually dozens of studies, including in humans, concluding that it is well tolerated, summarized in this extensive EU report from 2009. My laboratory completely agrees that triclosan has been significantly overused, and it should be reserved to combat life-threatening infections. The next steps for development are to initiate safety, efficacy and pharmacological studies. And thus far, our own studies indicate that triclosan is well tolerated when directly administered to the lungs. We hope that in the near future we will have enough data to initiate clinical trials with the FDA to test the activity of this combination in people afflicted with biofilm-based infections. We think our approach of enhancing biofilm activity with the addition of novel compounds will increase the usefulness of currently used antibiotics. Learning about how these compounds work will also shed light on how bacterial biofilms resist antibiotic therapy.